First, as promised, I have a GIVEAWAY WINNER to announce!! Congratulations to Julie (juliemcl), who is the winner of IKWYSR’s first book giveaway! Julie wins Revolutionary Road, a book that everyone should read (Excellent choice, Julie!). Thank you to all of you who entered the giveaway! And now on to the book review . . . I am flummoxed. Flabbergasted. Baffled. Dumbfounded. Perplexed. Befuddled. Confused. 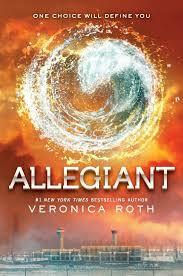 How are all three books in the Divergent Trilogy among Amazon’s top 20 bestsellers? How is Veronica Roth Amazon’s #1 overall bestselling author ? How was Allegiant named one of Amazon’s Best Books of the month for October 2013 and one of Amazon Editors’ Top 20 Picks for the Best Books of 2013 ? How, how, HOOOOWWWWW? None of this makes any sense. In fact, it actually makes me a little angry that Veronica Roth has been so successful with this book, considering how absolutely awful it is. I can’t say anything good about the book. Not one thing. You want the final book in a series to resolve existing conflicts, wrap up loose ends, and finish with a big, climactic, exciting ending. This book delivers exactly none of those things. Instead, the storyline got even more ridiculous and convoluted (and far-removed from the original concept), the Tris/Four relationship continued to go nowhere, and the action (what little there was) was (just like the second book) boring and repetitive. Using two first-person narrators is just a stupid trick, the only purpose of which is to make part of the book’s conclusion painfully obvious (and easier for Roth to execute). Normally, you like characters more as you get to know them better. Not so in this series. The characters become more annoying, less decisive, and more unreliable. This book was terrible. It took me WEEKS to finish. I didn’t care at all about what was happening (primarily because nothing of consequence actually happened). I am not alone in my disdain for this book. As I write this, there are currently nearly 1,600 1-star reviews on Amazon. Normally, 1-star reviews on Amazon are extreme, silly, and, often, just plain funny (Surely you’ve seen the hilarious 1-star reviews for Haribo Sugarless Gummy Bears. If not, do yourself a favor and check them out here) . But the 1-star reviews for this book are lengthy, often well-written and well-supported, and appropriately scathing (but FULL of spoilers, so beware). If you need more reasons not to read this book, have a heyday . Who should read it: NO ONE. If you haven’t begun reading the Divergent Trilogy, PLEASE save yourself a lot of time and energy, and read something better. Like The Hunger Games . Or Beautiful Creatures . Or one of Maggie Stiefvater ‘s series. Whatever you do, DON’T allow yourself to get sucked in by the decent first book. If you’ve read the first and second books in this series, STOP THERE. Any ending you can imagine will be better than the actual third book. Haven’t read the first book yet? You can read my review of Divergent (the first book in the series) here and my review of Insurgent (the second book in the series) here. One final (unrelated) note: Happy birthday to my best pal in the whole wide world! This entry was posted in Rating 1/5 and tagged Allegiant, Book review, Books, Divergent, Four, Insurgent, Tris, Veronica Roth. Bookmark the permalink. Sooooo disappointing! I had high hopes for this one. Lesson of the day: Don’t trust the hype, people. Ugh. I know! I really feel like I got swindled by that first book. Never again, Veronica Roth. NEVER AGAIN!!! First, I’m bitter that I’m not the winner. Grumps. Second, I’ve read the first two and I feel somewhat obligated to read the third one. But considering your review maybe I’ll just wait for the movie. First, I understand. But, fret not, there will be more giveaways in the future. Second, don’t waste your time. I know that feeling of obligation. I felt it myself. But, I promise you, it is NOT worth your time. If you want, I’ll just send you an email with the one big spoiler, and then you’ll have no reason to read it. Done and done. I got sucked in by Divergent, and then I made the mistake of thinking it would be worth it to find out how the series ended. It wasn’t. But you’re right; I should have heeded others’ warnings and not read it (just like everyone else should heed my warnings and read a better YA series instead). Ah, yes. I saw this. There is a lot of overlap with her list on the same topic from last year (which I wrote about here: https://iknowwhatyoushouldread.wordpress.com/2013/07/17/the-fault-in-our-stars/). The two books I’ve read that weren’t on last year’s list, A Long Way Down and This Is Where I Leave You, should be fun movies.